Does your business have a plan for bringing on social media marketers? Are you wondering how to work with experts outside the company while maintaining a consistent brand experience? Before you jump in headfirst or turn over the social media reins , check out the following eight tips to make sure your employees or contractors correctly represent your company. Agreeing on a style for outward-facing content helps solidify your company’s identity and character, and is the starting point of good social media employee training, because it puts all agents on the same page. Perhaps the biggest hurdle in creating a style guide is to define your company’s voice. If you’re working business to business in, say, the medical field, you’ll likely want to employ a professional voice. But if you’re working with freelance web developers who spend a good chunk of time every day on FailBlog, you can relax and crack some jokes. The point is to know your audience and have agents create content with your audience in mind. When creating your style guide, keep your goals in mind. What are you looking for from your presence on Facebook? Do you want to get users talking? Do you want their feedback so you can build a better product? Do you want them to advertise your brand for you by sharing your content? Once you establish your goals, you can amend your style guide accordingly. If your goal is to increase fan interaction, have agents create wall posts that are interesting to the community and ask engaging questions. If your goal is to seed your email list, create an incentive (like a giveaway) for signing up, and have your agents regularly announce the prizes and winners on the wall. rue21's engaging, community-relevant status update garners hundreds of likes and comments. No two people are the same, meaning that no two social media agents will write the same way. Having a style guide that defines voice doesn’t mean that you need to build a bank of terms and phrases for your employees to copy and paste, effectively turning them into bland robot parrots. With your company’s overall voice outlined in your style guide, encourage your agents to be creative. To add depth to your company’s presence, have agents sign off on wall posts with their first names or departments. Practice makes perfect, and that truth certainly holds in the world of social media. A probationary period in which new agents respond to wall posts but first submit their responses to a superior prior to posting is a great way to get agents up to speed. With direction and edits from the higher-ups, new agents will become accustomed to your brand’s style and voice quickly. You wouldn’t leave a phone ringing indefinitely in your office. It’s poor customer service. For the same reason, don’t leave wall posts on your Facebook page unanswered. Unanswered wall posts are far worse than an unanswered phone call, because the customer’s request or question is out there for the world to see—with a time stamp on it. Don’t let your page’s visitors get the impression you don’t care about your customers. Make it policy for your social media agents to engage on your Facebook wall frequently—addressing all questions and concerns posted. The great thing is that this works both ways. Because your Facebook wall is public, you’ll experience increased customer loyalty when they see that your agents respond to all requests promptly. 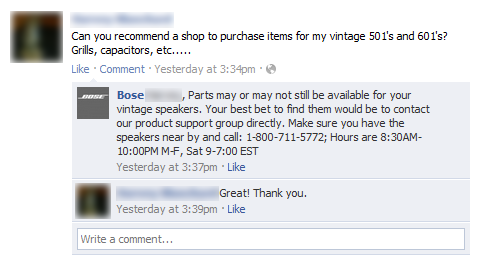 Bose demonstrates phenomenal customer service, answering a question posed on their wall within minutes. Once your employees pass through the initial probationary period, it still isn’t a good idea to have just one person responsible for your social media presence. Teams with two or more can moderate, edit and sharpen each other, giving you a refined, robust presence. Often it’s a good idea to have one person who’s more social media–savvy and another with a traditional marketing background. The social media expert can keep the marketing professional in line with social media practices, while the marketing professional can make sure your brand’s reputation and message are upheld. If content hasn’t had at least two sets of eyes on it, don’t let it go public. If your company is making its first foray into social media, take a look at a dozen or so of your top competitors and a few brands that do things right, like Starbucks or Coca-Cola. Take the good, leave the bad and add in your company’s unique voice. Formulating your approach as a team will take care of the training process for everyone, all at once. Whether you like it or not, your Facebook wall is a catch-all for praise, requests, demands, complaints, threats and everything in between. Make sure your social media team is ready to answer every wall post, even the disparaging ones, and is able to do so with respect and kindness. Outline a procedure for agents dealing with irate fans. But don’t just prepare for the negative; be ready to capitalize on positive feedback by incorporating it in marketing materials or a “reviews” section on your page or website. This complaint should probably have been directed to website personnel, but Newegg's social media agents respond promptly and respectfully. What do you think? What do you do to prepare employees to represent your brand on social media? Leave your questions and comments in the box below.